Welcome to the Couch Club, our weekly column devoted to all things #DCTV! This week, Ashley V. Robinson returns to discuss the Flash's recent focus on family, and how its hero and villain couldn't be more different when it comes to fatherhood. I’ve written so much about The Flash since DC launched the Couch Club, and I’ve often made the assertion that the show excels when it’s dealing with the theme of family. I think this extends to the villains as well. Sure, there are going to be a lot of speedsters because someone needs to pose a metahuman threat to Barry Allen. It’s no fun otherwise! But the best villains the Flash has are also driven by complex, and often difficult, relationships to their families. This season, we have just that in the form of Cicada. 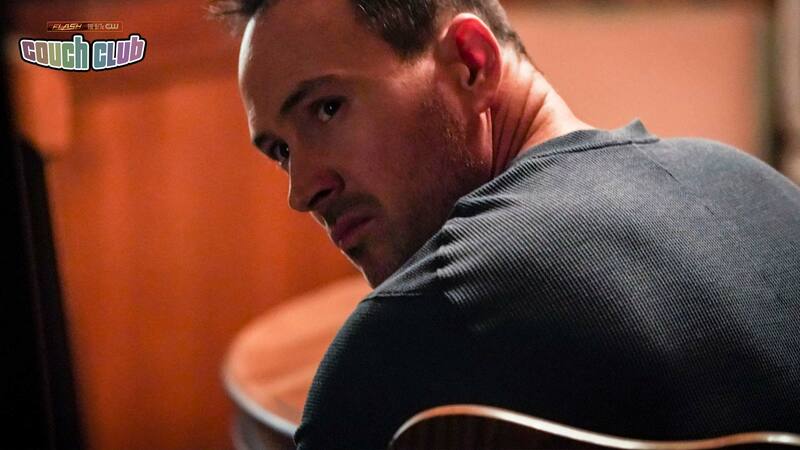 Chris Klein’s on-screen performance as Orlin Dwyer is a pretty far cry from the comic book character from whom he draws inspiration. Cicada is not only a recent addition to The Flash on television, but he is a pretty recent addition to The Flash’s comic book continuity as well. Cicada’s original alter ego is David Hersch, who first debuted in THE FLASH #171 in 2001, and his character can pretty easily be distilled down to an old man who can steal someone else’s life force to keep himself alive. This knocks Cicada into the category of Flash-Rogues-Who-Can-Time-Travel, although his metahuman abilities are a touch meaner than some of the others who came before. The Orlin Dwyer version has a little more backstory to go along with his ability to steal powers from other metahumans. In this respect, he’s set up as a literary foil for the Flash. Barry is trying his best to preserve the timeline and protect the daughter he didn’t know he had. On the other side of the morality scale, Orlin is doing his best to take down the people who put the daughter he didn’t know he would adopt in a coma. They are two men trying to look after the young women who are suddenly and unexpectedly in their lives and struggling with the right way to handle the responsibility. Their opposition runs deeper than that, though. Barry Allen uses his metahuman abilities to help people, while Orlin Dwyer uses his powers to hurt people. “Sure, Ashley,” you’re saying. “That’s pretty basic hero/villain dynamics.” And you’re right, but this dichotomy goes into the very nature of their powers. The Flash got his powers from an accident. He didn’t want them. The recognitions and responsibility that come from being Flash, the Fastest Man Alive, weigh heavily on everything he does. Access to the Speed Force drives him to be a better person. The Flash’s speed is rooted in his physical form—it’s literally inside his body. Cicada echoes this directly in that he also got his powers in an accident (it happens to the best and the worst metahumans), but instead of helping him, it directly corrupts him. Since the arrival of his powers coincides with Grace’s accident, Orlin is driven to use them to help her—he just wasn’t that good a person before she came into his life. As Cicada, he physically forces his enemies into submission and extracts what he believes he needs from them. And in contrast to the Speed Force, Cicada’s dagger is completely artificial. This is metatech we are dealing with (all over this season so far! ), something that’s completely detached from his body. It’s not something Dwyer has to deal with on the regular, the way Barry Allen does. Perhaps this slight distance between these men, their morals and the source of their power is all it takes to make an effective season-spanning villain? What will be interesting to watch unfold is how both men deal with the conclusion of their storylines. Nora Allen has a chance of sticking around on The Flash beyond season five, but I have my doubts about little Grace being around much longer than that (though we can debate whether the recent revelation that she’s aware of and supportive of Orlin’s actions makes the chance that she sticks around more likely). If Grace dies, there’s a possibility we’ll see Cicada collecting as much lifeforce from as many metahumans as possible to try and resurrect Grace, or bring her back from the very brink of death. We know Barry Allen is not only a hero, but he’s also a dad. No matter what Cicada might be getting up to, he would almost certainly have Barry’s sympathy—if not empathy. As we head into the final stretch of the season, if The Flash was to force its titular hero to look deep inside himself and find a way to help the show’s villain succeed in service of his family, that could make for one very powerful message about the nature of heroism.